January 26, 2019: The Prophet Jeremiah 49:23 says that Hamah and Tell Rifaat will hear evil tidings and then Damascus will be destroyed. Turkey is shelling Tell Rifaat now. Tell Rifaat is called Arpad in Jeremiah 49:23. The Turkish Army has already conquered a lot of territory in northwestern Syria. They are now threatening to enter northeastern Syria. This week the US, Russia, and Iran approved Turkey’s plans to create a “safe zone” in northeastern Syria. 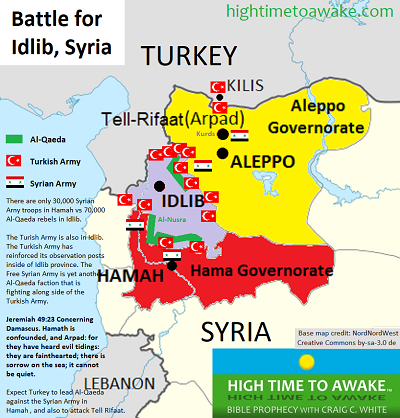 The Turkish Army is already deep inside of the Idlib province in northwestern Syria. Idlib is nestled between the cities of Hamah and Tell Rifaat. So the Turkish Army is already in position to attack these two cities that the Bible identifies. The Syrian Army is amassed in Hamah threatening to attack Idlib. This week Turkey has been shelling the Kurdish forces in Tell Rifaat. Shelling is usually a precursor to a land assault. We should definitely be watching developments in the northwestern Syria cities of Hamah and Tell Rifaat. Check out the map below to understand where the fighting forces are situated in northwestern Syria. Beginning in August 2016 Turkey took over a swath of territory along the Turkish border in northwestern Syria. Turkey took Afrin in March 2018. Tell Rifaat is part of the Afrin region. Tell Rifaat is the last remaining Kurdish held city in the Afrin region and in all of northwestern Syria. After Turkey took over Afrin the Syrian Army and some Russian troops entered Tell Rifaat to help the Kurds defend the city. Kurdish troops remain in Tell Rifaat and are reportedly positioned along the western side of the city in order to prevent a Turkish advance. 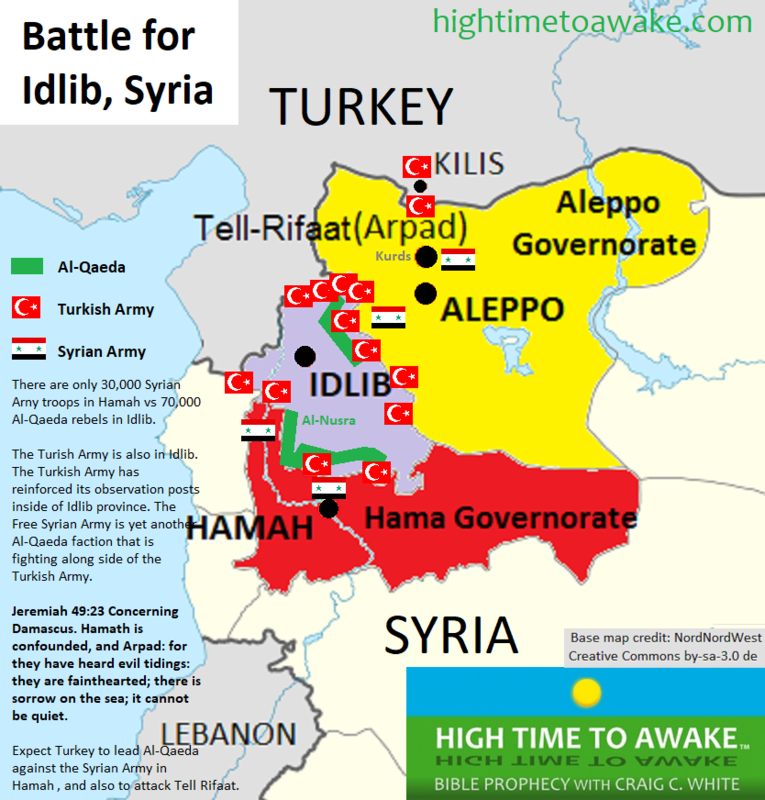 Over the past year Turkey has also continued to strengthen its military positions inside of Idlib. We have been watching and praying. Erdogan is doing all of this under the claim of peace or “Olive Branch.” He is making the case that Turkey is helping humanity, while accusing Israel of crimes against humanity. We are now witnessing the slow release of the spirit of antichrist. Do you think that America will engage in a major conflict before damascus in destroyed? Erdogan says that he can bring peace to Syria. That means that Turkey will wipe out anybody who disagrees with them (the Syrian regime and the Kurds) and it means the Turkish conquest of Syria. That has already begun in northwestern Syria. No I don’t think that the US will engage in any major conflict any time soon.